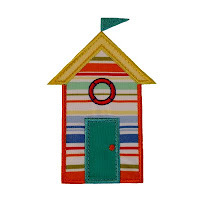 Use your stripiest fabrics and your brightest thread colors to bring the seaside to your home with a row of these gorgeous beach huts. 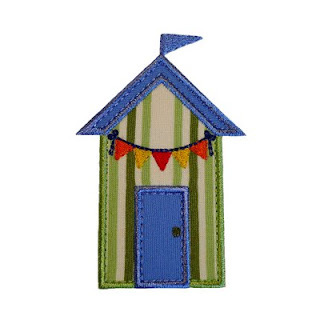 Stitch out a row of these very sweet seaside Beach Huts (also known as Bathing Boxes) to adorn your linen, cushions, t-shirts, beach towels and totes. Stitch onto fabric and stretch over a canvas frame for an inexpensive but effective way to dress up or coordinate a room! 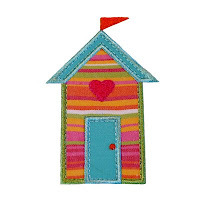 - and a plain Beach Hut you can personalize with fonts from your embroidery machine or personal files. 4x4 hoop - 3.93" x 2.67"
5x7 hoop - 5" x 3.34", 6" x 3.98" and 7" x 4.58"